Posted on 09/19/2018 by Mickey McCarter	in Live Review and tagged DC9, Dream Wife, England, London, punk. London-based rockers Dream Wife are taking DC9 by storm on Thursday, Sept. 27, after opening The Kills in DC earlier this year. 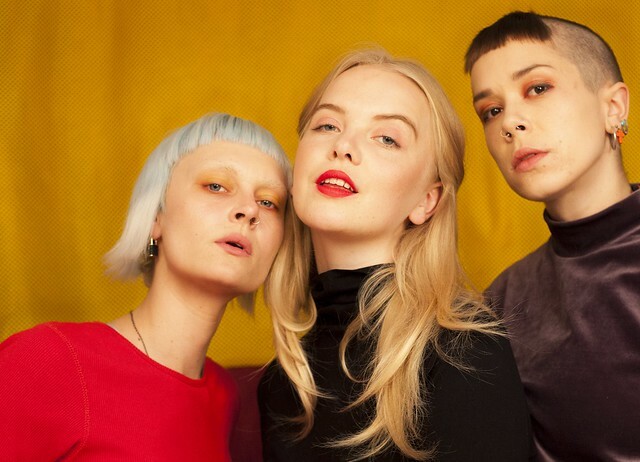 Rakel Mjöll, Alice Go, and Bella Podpadec first formed Dream Wife at Brighton University in 2015 when they were students in the United Kingdom. They took to touring and recorded a debut self-titled album, released this year via Lucky Number. Among the outlets that *loved* the new record were NME. “Not since Yeah Yeah Yeahs burst out of Manhattan in the early 2000s in a blaze of fishnets and glitter has punk rock been as downright fun. From the opening coos of ‘Let’s Make Out’ to the hammered-out closing chords and screams of the excellently sweary ‘FUU’, this is a record that revels in spontaneity and the sheer magic of three best friends getting together in a studio and having the time of their lives. That in itself would be enough for an album to be good, but the fact that the songs are lick, riff, and catchy chorus-packed makes it great,” declared Leonie Cooper in a review.